Bishop Yoohanon Mar Chrysostom of the Syro-Malankara Catholic Eparchy of Pathanamthitta, left, visits with Msgr. John Kozar at CNEWA’s New York office today. Today, Bishop Yoohanon Mar Chrysostom of the Syro-Malankara Catholic Eparchy of Pathanamthitta in India dropped by our office in New York. He met with Msgr. John Kozar, CNEWA’s president, and Thomas Varghese, CNEWA’s vice president for India and Northeast Africa, and discussed the many activities of his eparchy. To learn more about the Syro-Malankara Catholic Church, read our profile of the church in the November 2005 issue of ONE. Also, back in March Msgr. Kozar made his first pastoral visit to India and blogged about it along the way. My first exposure to the rich Ge’ez Rite would come at an early morning Divine Liturgy the following morning at St. Anthony of Padua Cathedral. The bishop and most of the eparchy’s priests concelebrated the ancient liturgy. I was taken aback by the beauty of the liturgy, the amazing intricacy of the chanting, not just of the bishop and the priests, but all the many faithful who had assembled as well. The cathedral had a large of number of people for this ordinary weekday eucharistic liturgy, celebrated at 6:20 a.m. All of the faithful are farmers and some regularly walk great distances to attend. Another impressive aspect of the cathedral is the outstanding paintings that adorn most of the walls. These are works of art in progress, as the bishop has commissioned an 80-year-old Orthodox priest-iconographer to paint the cathedral murals. After four years of labor, I would say this venerable priest is about 80 percent finished. He lives with the bishop and two other Catholic priests assigned there, together sharing their lives, meals and prayers. I had the honor to meet this outstanding artist and thanked him for his great gift. For more, read Msgr. Kozar’s first blog post in his series from Ethiopia, A Warm Welcome. President-elect Mohammed Morsi, center, meets with Christian leaders from different denominations at the presidential palace in Cairo on 27 June. “We hope that he will fulfill his promises,” the Anglican bishop of Egypt said after Egypt’s first elected Islamic president, Mohammed Mursi, promised to be a president for all Egyptians, to appoint a prime minister who is not from the Muslim Brotherhood, and to appoint a Christian vice-president. [Anglican] Bishop Mouneer Hanna Anis expressed this widely shared hope in a letter to his community and friends shortly after the election results were announced on Sunday evening, June 24. Mursi, a member of the Muslim Brotherhood, gained 51.7 percent of the vote in the freest and most honest election to be held in the country since 1952. His opponent, Ahmed Shafiq, the last prime minister of the deposed President Hosni Mubarak’s administration, gained 48.3 percent. The results have revealed a deeply divided country and much fear among Christians — who count for some 10 percent of the population, and among the secular and liberal sectors of the electorate. About 40 percent of the 50 million people entitled to vote actually did so. Mursi’s election “may be the best thing for the moment, in order to avoid violence, but performance will be important,” a senior Catholic leader in Cairo, who wished to remain anonymous, told me. The letter was signed by Monsignor Kyrillos William, the bishop of Assiut and acting head of the Coptic Catholic Church in Egypt, which has between about 200,000 members. Writing in the name of the Coptic Catholics “in Egypt and in the countries of the diaspora,” the bishop congratulated Mohammed Mursi “for having gained the confidence of the people” in the mid-June presidential elections. For more on the responses of Egyptian Christians to the election, click here. 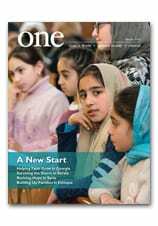 For more on Egypt’s Coptic Christians, check out the September 2011 issue of ONE magazine, where we explored the plight of Christian women in Egypt and profiled the challenges facing one woman reporter. Picture of the Day: "Holy Russia's Soul"
As my departure for Moscow approached, I thought my visit would answer some questions and confirm a few opinions. I was certain I would have much to write about Moscow, and Russia by extension. I thought wrongly. Instead I am baffled by a city and a nation confused about its past, present and future. In a land where great numbers of saints once walked on pilgrimage, where writers and philosophers discussed how to improve the peasants’ lot, where revolutionaries gathered to plan an earthly paradise, the victims of corruption, greed and fear now wander. Poverty, political instability and moral and spiritual apathy have generated a loss of self-knowledge. “Holy Russia has lost her soul,” lament her cultural, religious and social leaders. References to the Russian “soul” abound in this nation’s history, literature and religious philosophy. Today, after more than 70 years of communism, the now-proverbial search for the Russian soul is nothing else than the search for what is authentically Russian. For more, read This Year, Moscow. In this image, captured 21 February 2011, Father Paolo Dall’Oglio presents a lecture at The University of Scranton titled “In Love with Islam, Believing in Jesus,” emphasizing the importance of mutual understanding between Christians and Muslims for peace in the region. Word reached us last week that the Syrian government had expelled Father Paolo Dall’Oglio — an Italian Jesuit who restored an abandoned Syriac monastery in the desert — for his prayerful peacemaking efforts in the country, which is on the brink of civil war. After restoring the sixth-century monastery, Father Paolo refounded Mar Musa as an ecumenical religious house for men and women under the patronage of the Syriac Catholic patriarchate. He consequently transformed the monastery into an important center for Christian-Muslim understanding in the Middle East. Over the past 12 years, the Pokrov Foundation has launched an assortment of programs — philanthropic, educational and promotional — that have done much to help restore the role of the Orthodox Church in Bulgarian life. Many are run out of Mr. Sinov’s spiritual home since his baptism, the Church of the Pokrov, located on a quiet street hidden by Sofia’s Hotel Rodina. In the church’s basement, the foundation operates a parish center that caters to about 4,000 people each year. Here, food, clothes, counseling, financial support and social space are offered to the needy. If the foundation lacks the resources to help someone, then it refers him or her to another nongovernmental organization that can. For more, read Under Mary’s Mantle. Some 110 students are now studying the language at the elementary school as a result of years of effort by village resident Shadi Khalloul, 37, chairman of the Aramaic Christian nongovernmental organization in Israel. Spoken Aramaic, the root language of all Semitic languages, is still preserved in parts of Syria, Iraq and Lebanon — and even by elderly Jews originating from a region of Kurdistan — but the spoken language has been virtually lost in Galilee, where about 10,000 Maronite Catholics use it solely for prayer. During their daily interactions, they speak Arabic. For more, read Maronites in Israel Learn Aramaic. On Friday night, the Catholic Press Association held its annual awards ceremony. Shattering our previous record, ONE left with a whopping 20 awards across an array of categories — including first place in “General Excellence” and “Best Blog”! The full list follows, along with commentary from the members of the judges' panel, which included journalism professors and staff from the Catholic University of America; Spring Hill College, of Mobile, Alabama; and Marquette University, of Milwaukee, Wisconsin, as well as professionals from the field. “Ramadan Observed,” by Elias D. Mallon, S.A.
Congratulations to all of our staff members and contributors who made this possible!